New research shows that for older war veterans, the love and support they receive from therapy dogs can significantly ease social isolation and help bring back fond memories. That’s according to a joint study from McMaster and the Universities of Saskatchewan and Regina which found that therapy dogs have a positive influence on the health and wellbeing of older veterans and could potentially help meet the health needs of the growing population of younger veterans. The study, which was conducted in partnership with the St. John’s Ambulance Therapy Dog Program, looked at how regular visits from therapy dogs improved the quality of life for older adults living in a Veterans Affairs Canada residence in Saskatoon, Saskatchewan. “We worked with older adults with a history of military service who could benefit from increased social interaction to understand the contribution of therapy animals to veterans living in a long-term care setting,” says James Gillett, an associate professor in McMaster’s Department of Health Aging and Society and associate dean, Research and Graduate Studies who was a co-investigator on the project that included researchers from the Universities of Saskatchewan and Regina and numerous community partnerships. James Gillett, an associate professor in McMaster’s Department of Health Aging and Society, was a co-investigator on the study. 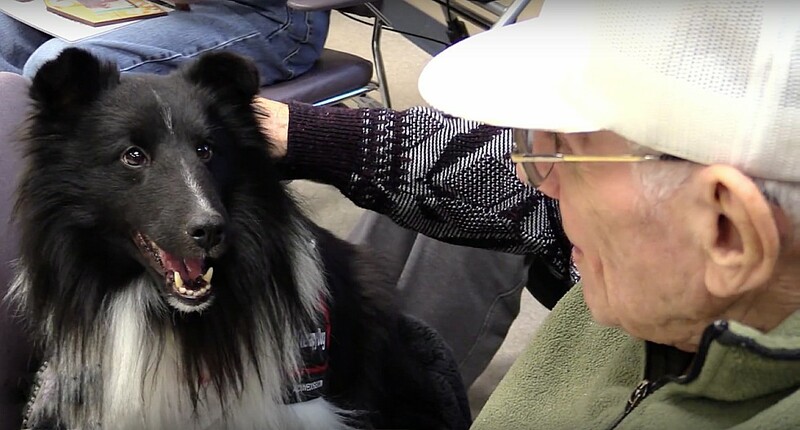 Throughout the study – which took place over a 13-week period – the veterans participated in weekly 30-minute individual or group visits with therapy dogs and their handlers during which the veterans played and interacted with the animals. Researchers found that not only did regular visits with the therapy dogs significantly increase social engagement among the veterans, many of whom had previously reported feelings of loneliness or boredom, they also helped to bring back positive memories and provided opportunities for veterans to reminisce. In fact, many found the visits to be so positive that a number of veterans worked with local musician Wes Froese to write a song and create a video called I had a Dog to promote understanding of the beneficial role of animal-human relationships. According to Gillett, finding ways to effectively address the health needs of older war veterans is critical. Research shows that older veterans are often in poorer health and have worse physical and mental health outcomes that their non-veteran peers. Many veterans may also be suffering from Post-Traumatic Stress Disorder (PTSD) as a result of their combat experiences, the effects of which tend to worsen with age. Gillett says this study suggests that regular visits with therapy dogs could help meet the needs of older veterans and could be beneficial for younger veterans, but adds that further research is needed before formally incorporating therapy dogs into care. “We need to develop a set of best practices and knowledge around how, and in what circumstances, therapy dog interventions can be valuable, both the for person involved and for the animal,” he says. This study was funded by Veterans Affairs Canada, with a grant through St. John Ambulance Canada and local Therapy Dog participation from the St. John Ambulance Saskatchewan. The development of the song and video was supported with a University of Saskatchewan One Health grant.